The Black Friday 2017 shopping season is almost here, and if you’re thinking about a new television, there’s one I can recommend based on recent experience. I splurged on a 55″ LG OLED television last month, which I was able to get at Black Friday-level pricing. I should note that I can’t boast that Meador Manor has a true home theater. Unlike some rich folks, we don’t have an elaborate home theater room with a big expensive screen, projector, surround sound, fancy seats, or lighting. We just have an entry-level surround sound system in our living room, hooked up to a television that sits on a stand. We mostly stream movies from Amazon or iTunes, share YouTube videos via Airplay, and have a regular Blu-Ray player. But, nonetheless, our new television is pretty impressive. Currently you can buy the same television for “only” $1,500, but if you’re like me, you need some good reasons to plunk down that sort of cash! So I’ll outline for you what I had before, why I chose this unit, my initial impressions, and the additional forthcoming upgrades it has prompted. In 2010 I upgraded from a 30″ HDTV cathode ray tube television television to a 40″ Sony KDL-40HX701 LCD television that cost $800. I’ve been very happy with that television, but it is considered small by today’s home theater standards, and it can’t support the higher resolution, higher dynamic range, and wider color gamut that have become available for some movies in recent years. Mind you, Wendy and I rely on our iPads for most of our video watching, only turning on the big system to share a movie or a video clip with each other and for my weekday morning workouts to old aerobics videotapes. Meador Manor has not had cable TV service since 2008, when I switched to internet-only service. While I do have an antenna I mounted on the chimney back in 1995, and it pulls in many HDTV broadcast channels from Tulsa, we almost never tune those in. So why in the world did I just spring for a new television that cost me $1,600, and is still $1,500 at Black Friday prices? As usual these days, the answers are acronyms: HDR and OLED and DCI P3; but I didn’t buy it for its other major abbreviation: 4K UHD. Below I’ll make some sense of this blizzard of acronyms and their meanings for my older Sony Bravia KDLHX701 and the new LG OLED55B7A television. Old Sony set: Its pixels work by having placing a thin-film-transistor liquid-crystal display (LCD) in front of a cold cathode fluorescent lamp. So it creates darker areas, including its attempt to display black, when its liquid crystals are energized and untwist, so that far less light passes through two perpendicular polarizing layers. The color is provided with red, green, and blue filters. Some light always leaks through, so “black” on these sets is a dark gray, limiting its contrast. 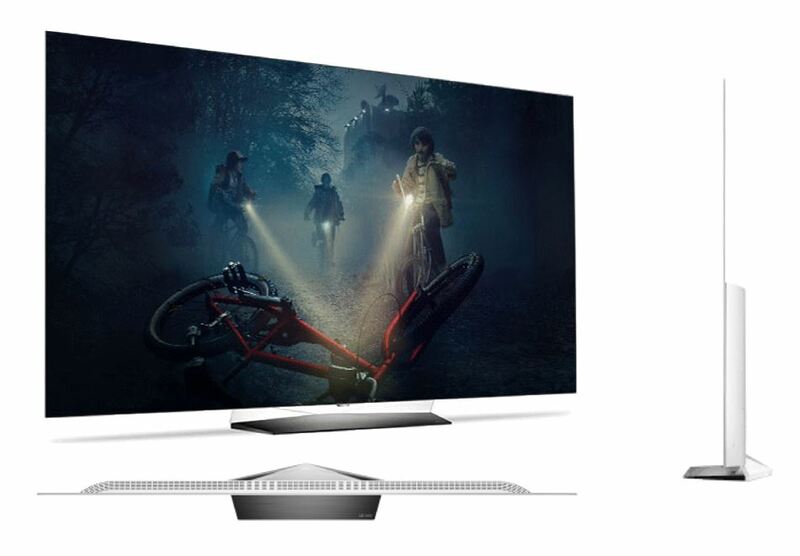 New LG set: Its pixels are organic light-emitting diodes (OLED) which directly emit light when energized in what is called electroluminescence. The different colors come from organic compounds in the diodes that produce yellow (i.e. red and green) light or blue light. Color filters allow these to be manipulated to produce red, green, blue, or white light. Since each pixel is self-illuminated, when one is turned off you get a true black with incredible contrast. This creates a much more pleasing image, even though OLEDs cannot reach the highest brightness levels some LCD sets can produce. My new set reaches 1,000 nits of brightness in its highlights, which is quite good. Old Sony set: Its backlit LCD produces standard dynamic range (SDR) images, meaning it has a typical brightest-to-darkest ratio for its pixels. New LG set: Its OLED technology gives it high dynamic range (HDR), so there is a greater difference between its brightest and darkest pixels. It supports both the HDR10 Media Profile and Dolby Vision HDR standards, which are the two most common standards for transmitting high dynamic range information in a video signal. Supporting both standards allows me to not worry about that latest format war. Color gamut refers to the range of colors a set can produce. Older HD televisions like my Sony set provide the range of colors in the Rec. 709 standard, but newer sets can offer a broader range of colors, which is also called a “wider color gamut”. My new set covers 99% of the larger DCI P3 color space standard for digital movie projection, so that’s good enough. Someday we’ll have sets that cover the even larger “Rec 2020” color space, but there’s no telling when that will be. Old Sony set: Its 40″ diagonal screen has 1920 x 1080 pixels, which is the top resolution of standard high-definition (HD) television. As for how it builds up each image and how often that is refreshed, it can show typical high-definition videos with 1080 progressive scan lines with 24 frames per second for most movies (actually displayed at 60 frames per second via a duplication process called 3:2 pull-down) or 60 progressive frames per second for videos, while also supporting the lower-level HD resolution of 720 progressive scan lines and the old-style NTSC television signal’s 480 scan lines which interlaces half of them at 60 frames per second for an effective 30 full frames per second. New LG set: Its 55″ diagonal screen has 3840 x 2160 pixels and can show ultra-high-definition videos with 2160 progressive scan lines. It scales up the older lower-resolution standards as needed. Whereas switching from standard definition to high definition was important for a sharper picture, this change is NOT. At a normal viewing distance from any reasonably sized television, our eyes simply cannot perceive the increased resolution. At Meador Manor, we sit eight feet from the screen. So we would have to upgrade to a screen size of 80″ or more to actually perceive a difference between HDTV’s 1080p and UHD’s “4K” resolution of 2160p. So you really shouldn’t buy a television just for 4K resolution and certainly should not ever waste money on an expensive 8K set. Cameras are the same way, where the number of megapixels is now generally so high you don’t need to worry about it. Computers went through this sort of shift long ago: we used to be able to tell a computer would be faster because it had a higher clock frequency (various megahertz and then gigahertz numbers), but that has stalled out and now you have to think about how many cores are in a chip and how a solid state drive is the key to fast performance. The bottom line? If you already have a large LCD HDTV, don’t upgrade unless you get a set that supports HDR and wider color gamuts, and you should shift from LCD to OLED technology to really get a visual bang-for-your-buck. The big new OLED TV arrived a couple of weeks ago. I knew it would be incredibly thin, except for the lower portion with the electronics, but it was still startling to compare it to the older LCD television. However, since we don’t mount our TV on the wall, the thinness is not a feature we really care about, while the reduced weight was certainly nice for moving it about. Hooking up the system components was easy, even though my old audio receiver lacked HDMI ports, since I could use optical audio out from the TV to the receiver and the TV itself had plenty of HDMI ports for the Blu-Ray player, Apple TV, and more. It has built-in support for Amazon Prime video, so I didn’t need to plug in my older Amazon Fire TV Stick, and I replaced my 4th-gen Apple TV box with a new Apple TV 4K box for $199 to ensure any iTunes movies we rented would be the best available. To try and illustrate the imagery the set can provide, I set a tripod on the couch with my Canon EOS Rebel T6 digital SLR camera and used a Canon EF 24-105mm f/4L IS II USM lens to take some shots during the day with daylight streaming in from open blinds on the left side of the view. The TV actually looks better in person than it does in the shots, since the camera picks up pixellation that is not perceived by the human eye when actually viewing the set, and its own sensor interacts with the incoming light differently from human vision. My first views were of 4K HDR screensaver videos on the Apple TV 4K, which were stunning for both Wendy and me. The extra resolution doesn’t matter for watching something from the couch, but 4K is so high-res you can get within a couple of feet from the screen and not see any pixels. The high dynamic range and wide color gamut of the OLED set means it finally lives up to the hype about seeming like a window looking out on the world, given the limitations of the human eye. 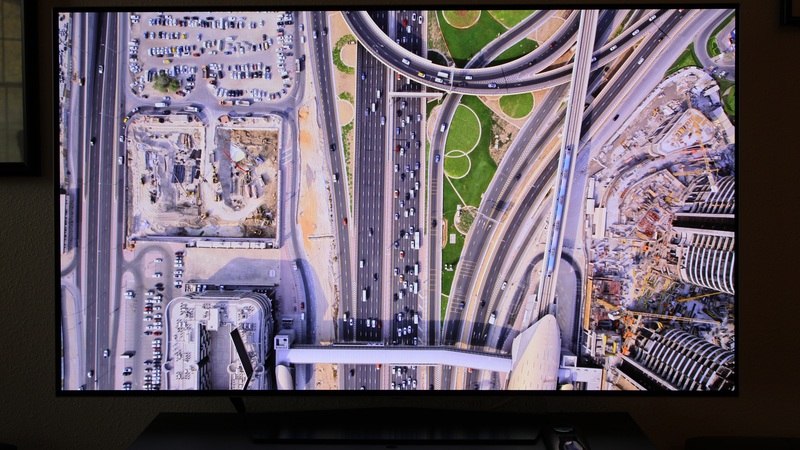 You can try viewing one of the Apple TV 4K screensavers on a computer monitor using YouTube, but you have to be sure to click the settings gear icon at lower right, pick Quality, and select the 2160p 4K version, and of course the monitor or device you watch it on may not actually reach 4K resolution. Notably, the YouTube versions do NOT support high dynamic range. 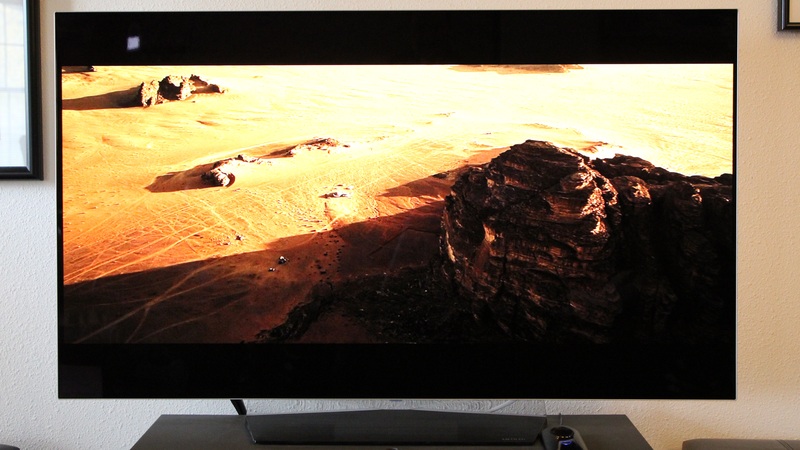 I loaded up a preview of The Martian on the Apple TV 4K, which claimed to be streaming in both 4K and with HDR. I tried to capture a shot showing how HDR allows for very bright and very dark imagery in the same shot, without blowing out all of the highlights or losing the shadow details. Note that this is an effects shot, so it was NOT actually rendered in 4K resolution. 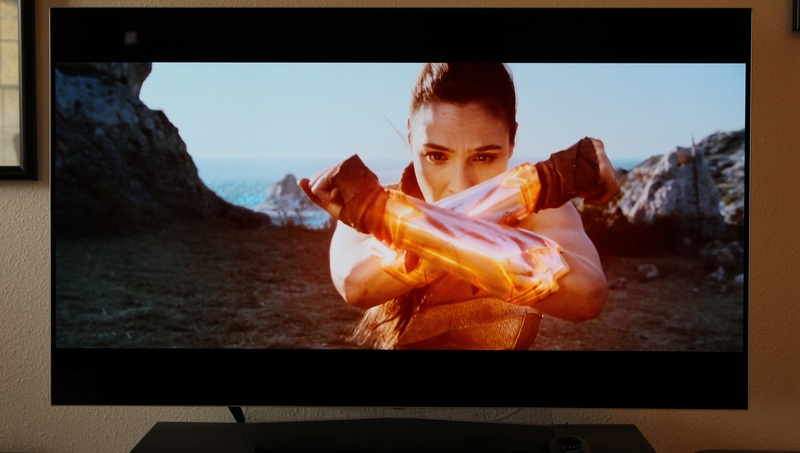 Amazon video is built-in to this LG television, so I got a shot from the 4K preview of Wonder Woman from that. However, the video and effects in that film were not true 4K. Again, the banding you’ll see in the shot below is not perceivable when you view it in person. The TV upscales lower-resolution signals, so I connected the chimney-mounted antenna I erected back in 1995 and pulled in a 1080p HDTV broadcast from a Tulsa station. It looked great. So what about a simply terrible legacy video source? The unit has to deal with that each weekday morning when I play back an episode of Everyday Workout from one of my quarter-century-old videotapes. From 1993 to 1997 I recorded episodes off the Lifetime cable channel onto VHS tapes, cramming 10 or more episodes onto each tape by using the low-quality EP/SLP mode that recorded six hours of video per tape. At first I tried the weird combination dongle that came with the TV to connect my VCR’s composite video cable and RCA stereo audio cables into a single yellow port on the back of the TV. The sound worked, but the video would not show up, no matter what settings I adjusted. So I gave up and ran a 75-ohm coaxial cable from the VCR’s output into the matching Antenna/Cable In port on the television. That worked great, but I also needed to connect the outside aerial to that same TV input, since my old VCR can’t understand modern broadcast HDTV signals. Using a cheap splitter in reverse to connect both sources into the television yielded a picture, but with terrific interference. A cheap hardware coax A/B isolation switch solved that problem, with me punching one button to connect to the VCR and another to connect to the antenna. As one would expect, the image from the old videotape was extremely soft. After all, when upscaling a VHS tape, the TV is taking an input with an effective resolution of 333 x 480 pixels at best and scaling that up to 3840 x 2160 pixels. In this case things were even worse since the source tape was recorded in the worst-quality mode. So I was impressed by how well the TV plays back marginal legacy sources, and my morning workout videos look better than ever. The webOS 3.5 Smart TV software for selecting content and services is pretty handy and easy to use with the included Magic Remote. The remote is gyroscopic, so you just wave it around to move the cursor, and it supports voice commands. You select sources, from Live TV to a connected device to online streaming services, by pressing a button and picking a blade icon from a scrolling set at the bottom of the screen. There is a promotional video that illustrates the interface. The remote offers only partial control of the audio receiver and doesn’t control the Blu-Ray player or Apple TV, so if you have a surround sound receiver and other devices, you will either need to use multiple remotes or try using an expensive universal and programmable Harmony remote from Logitech or the like; more on that later. A button on the remote lets you quickly navigate commonly used settings with the cursor, and of course you can also dive into the setup menus to burrow deeply into various obscure settings. I had to do that to deal with a picture and sound synchronization issue with the Apple TV 4K. My old audio receiver is needed for surround sound, but it lacks any HDMI ports. So I had to feed the Apple TV’s HDMI output to the TV and then send the audio from the TV to the receiver via digital optical cable. That pathway delayed the audio output, so I had to manually adjust a delay setting in the TV menu system, using trial-and-error, to get the picture and sound to synchronize. I was certainly glad the set included the ability to fix this sort of problem. The first movie Wendy and I watched on the new television was not a modern 4K HDR movie. Instead, we continued to draw from long lists of movies each of us has compiled, alternating between each others’ lists for our movie nights. This time it was time to pull something from my list. Her list had yielded The Hurt Locker last time, which was pretty violent and intense. 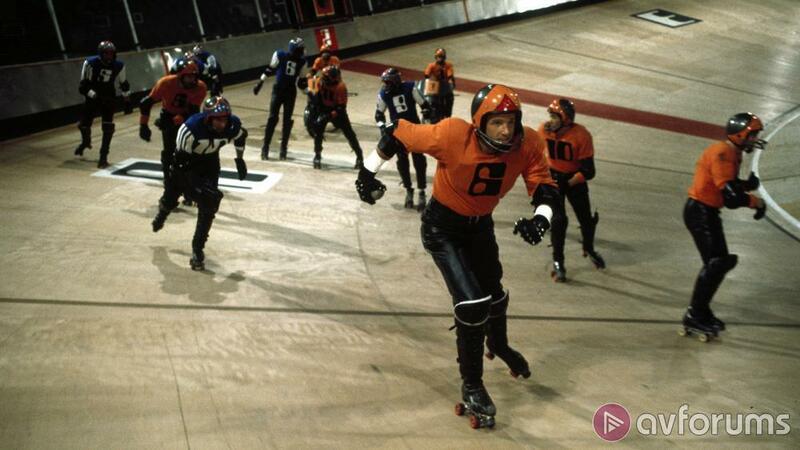 So I retaliated by picking the violent but very dated and oddly paced Rollerball, a 1975 Norman Jewison science fiction dystopia that fascinated me in my youth. It certainly wasn’t in 4K or HDR or the like, but I was still surprised on how good it looked on the new television. We streamed a HD version from iTunes that probably originated from the movie’s Blu-Ray reissue. The picture was so sharp and clear that it looked more like what I associate with television soap operas than the grainy and fuzzy film transfer I recalled from watching it on old broadcast TV and on VHS or DVD. I was startled to see for the first time the wood grain on the ramps in the arena, and the closeups of the garish eye make-up on the females in the movie were disturbingly clear. Given my experience with old sources, I’m confident that new movies shot in HDR and wide color gamut will be truly stunning on this set, while 4K resolution won’t really matter much when you sit back to watch, but it is there if you want to get ridiculously close. If I tried to use all of the remotes for the various devices in our system, I’d have five of them splayed out on the side table. 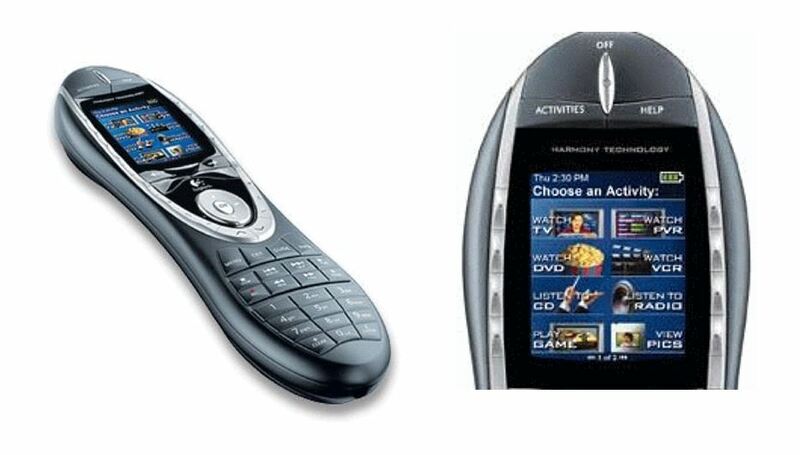 But since 2007 I’ve used a Logitech Harmony 880 programmable remote control to simplify things. With my old system, I could control almost everything, except the Amazon Fire TV Stick, with the Harmony remote. One button would turn on the television, receiver, and any other needed device and set both the television and the receiver to the appropriate inputs. Faced with the new television having to serve as the HDMI hub, I pulled out my old MacBook Air laptop and legacy Harmony software to adjust the programming on the Harmony remote, which was updated by plugging it into the laptop with a USB cable. A lot of tweaking got most things to function, but there are still glitches with the audio source and muting when switching functions. That and the lack of HDMI support in my old audio receiver prompted me to order a newer Harmony Companion remote control and a new Sony audio receiver. I’ll set those up and then report on them in a later post. If you already have a big LCD HDTV, upgrading to an OLED television like this with HDR and a wider color gamut might be worthwhile, but don’t waste your money on a 4K LCD television that lacks those extra features. And, as always, be aware that upgrading one component in a system of devices may lead you to upgrade additional ones as well. That’s it for now; I have a new receiver and universal remote to unpack and set up! This entry was posted in HDTV, movie, technology. Bookmark the permalink.